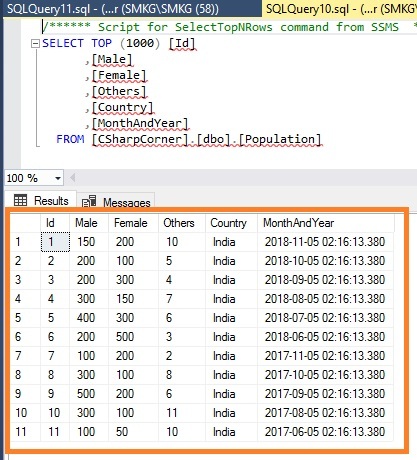 First, we will create a table in SQL Server to generate a chart with the country population details in ASP.NET MVC Web application. I have created a table called "Population" with the following design. Execute the below query to create a table with the above design. To add these dummy data values of the countrywise population, execute the below insert queries. 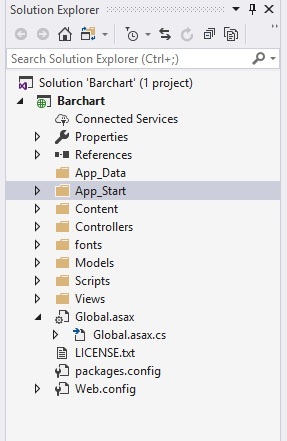 To create an ASP.NET MVC empty project, follow the below steps one by one. Here, I have used Visual Studio 2017. 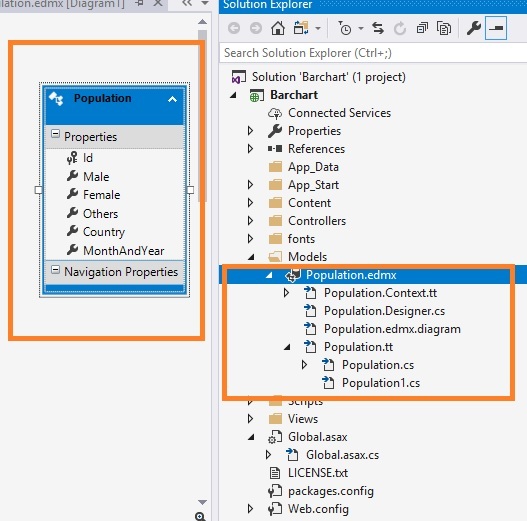 Select New Project -> Visual C# -> Web -> ASP.NET Web Application and enter your application name. Here, I named it "Barchart". Then, select Empty ASP.NET MVC template and click OK to create the project. Once you click OK, the project will be created with the basic architecture of MVC. If you are not aware of how to create an Empty ASP.NET Web Application, please visit Step 1 and Step 2 to learn. Once you complete these steps, you will get the screen as below. Now, create an empty Controller and View. Here, I created a Controller with the name of "ChartController". Whenever we create an empty Controller, it is created with an empty Index action method. And create an empty View of this action method "Index". I discussed C3 Installation and integration in MyPrevious Article. Now, write a logic in your Controller to fetch the data from the database and return that data as JSON to the View. In the below code, you can see that I have created a "BarChart" action to fetch the data from the database using Entity Framework. In View, add a Controller which will act as a bar chart in our application. For that, I have added one div with the name of Barchart. Now, write the logic in jQuery AJAX to get the JSON data from your controller action. In the below code, you can see that we are trying to retrieve the data from BarChart action under chart controller. In the result, we can see that we got the chart as per the data. Now let's do some customization on this chart. We have many records for a year, so now we will try to show the record in a single bar. We achieve that using a stacked bar chart. We have to use the groups and need to mention the columns to merge in a single bar. The grouping will happen by mentioning the column name, if you want to do two column groupings, you can remove the respective column from that column array. We will do more customization on the bar chart in the next article. Refer to the attached project for reference and I did attach the demonstrated project without a package due to the size limit. In this article, we have seen how to generate a C3 Bar Chart in our ASP.NET MVC5 web application with JSON data using Entity Framework. I hope you enjoyed this article. Your valuable feedback and comments about this article are always welcome.